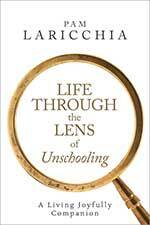 Coming to unschooling, how do we begin to see the learning in everyday moments? It’s there, but when we’re used to seeing learning through the filter of conventional school, it can be hard to spot at first. We might still be looking for someone playing the role of teacher—showing our children the “right” way to do something. 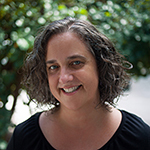 Maybe we’re still looking for a studious expression of intent (“I want to learn how to do X”) and a standardized path to that end (the gathering books and videos for research and worksheets for practice). We’re probably still looking for subjects: math and reading and science. But what we’re seeing just looks like play. And that’s not learning, right? Learning is work; the opposite of play. Seeing the learning is our work to do, not theirs—they’re already busy doing the learning! When I began looking for the learning in my children’s everyday moments, I would ask myself questions to help me dig more deeply into their activity, past the superficial view of “just playing.” Let’s look at some of those questions. This is the most basic question. Chances are, they are probably learning something from the activity itself. Even with a simple activity like tossing a ball back and forth, they are exploring force and gravity and physics and movement. How far can they throw it? How high? What happens with a heavier ball? Lighter? How do they adjust their throwing technique to increase their aim? Underhand? Overhand? All stuff they may try out as they play, and all experimentation that will increase their understanding of basic physics in the world. Critique—whether with you, among friends, or online in forums and blogs, players share their opinions on which games they enjoyed overall, detailing the aspects they loved or felt could be improved (the battle system, the subject, the dialog, the art etc). Really see what your children are doing. Have conversations and really listen. Don’t just gloss over it, with preconceived notions firmly in place. 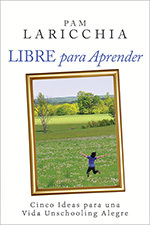 By noting the next step in their activity, and their next activity, you begin to see the particular path of learning connections they are following. In other words, you can watch their train of thought play out in their actions. For example, say your child has been playing Age of Mythology, a computer game, quite a bit lately. You wonder what’s up with that. You ask and she says “it’s fun!” Then a couple weeks later when you go to the library, she picks up a book about Zeus. Interesting, you think. That’s new. It seems like part of the fun of the game is the mythology aspect. Better understanding what she’s enjoying and learning from the game can help you bring more things into her world that she’ll find really interesting. Maybe another mythology-based game. Or a movie or documentary. Or a fun website. When you more clearly see the connections between the things they choose, you are more able to bring things into their lives that they will truly enjoy. And in turn, better support their learning. Are they happy? Interested? Going through the motions? In the flow? These are clues to how engaged they are with their activity, and hence their learning. If they seem bored, maybe bring out that new game or movie or trip you were saving for an opportunity. Maybe now is it. If they are interested in something, maybe bring them more of that. More supplies so they don’t run out. Or more books/movies/games with similar content so they can continue to immerse themselves. If they are so engaged in their activity that they are in the flow and they don’t notice much going on around them? Maybe don’t disturb them. Even discourage others from distracting them. Help them stay in the flow as long as the activity sustains it. There is so much learning in there! Beyond the feedback about the activity itself, this is where they are also developing self-awareness and trying out different tools for different situations to see which work well for them. Are they curious for more? Bored and ready to move on to something else? Are they getting frustrated because things aren’t going as they hoped or expected? That emotion is direct feedback about how to accomplish whatever it is they are attempting—what they’re trying isn’t working so well. In those moments, not only are they learning what works or doesn’t work in activity, they are also exploring (i.e. learning about) ways to cope with frustration. Maybe they push through, their perseverance paying off as they finally accomplish what they set out to do. Another experience to add to their repertoire of tools to consider when things get challenging. Maybe they take a break, for an hour, or a day and when they get back to it with fresh eyes things go smoothly. Maybe they don’t. Maybe you unobtrusively bring them a glass of water to initiate a short break and some needed hydration. Whatever approach, it nets them more experience to incorporate as they build their understanding of themselves. There are some moments that stand out in my memory. I remember the time Joseph walked up and handed me a video game cartridge, asking me to hide it for a while. He said he was getting very frustrated with it, but whenever he saw it he kept wanting to try again. It was a few months before he asked for it back, and things we’re fine from there. It wasn’t really about the game—he was exploring and learning about himself. And there was the time Lissy was determined to learn how to dive. It was just before dinner time when she started. After a few diving attempts of varied success, the boys were done swimming and went into the house and I believe I said something like, “A couple more then let’s go in so I can make dinner.” She did a couple more dives, and kept going. Dive. Swim to the ladder. Back to the diving board. Belly flop. Swim to the ladder. Back to the diving board. She was resolute. I thought about it, and decided not to insist she get out. Through her actions, she was telling me how important it was to her in this moment. I chose to instead make peace with dinner being later than our routine. I think she kept going for forty-five minutes! And her dives were consistently clean by the end. I recall it was a huge aha moment for me. Her dedication and perseverance, trying again and again and again, was a shining example to me that an intense dedication to learn something could actually be internally motivated by their own goals. I was in awe. It was also an example to me at how important it was to follow their lead when possible—look where it went! True, maybe sometimes I won’t have the option to let her continue to do something as long as she wants. But by asking myself “why not?” in moments like these over the years I’ve found that, more often than not, I really can. Taking the time to dig into the roots of your children’s every day activities can help you discover the learning that is happening All. The. Time. And the conventional school filter will soon melt away as you see them explore and engage with the world around them. 4. 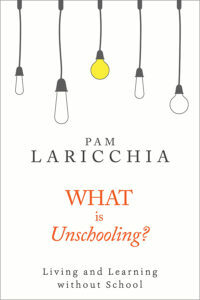 Do Classes Hinder Deschooling? 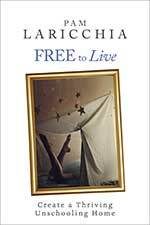 I want to be on board with letting go–REALLY letting go of rules regarding t.v. & video games! I’ve read many of your posts on this topic and I just can’t quiet one question that plays deafeningly loud in my head: How do I know my son won’t become a screen-junkie who only has interest in artificial stimulation, growing up to become a couch-potato loser?! Yes, I do realize how biased that is but I just can’t seem to temper that bias regardless of the amount of viewpoints I’ve read debating the good vs. bad video games/tv discussion. Im in desperate need of some insight & wisdom because going back to school isn’t an option in my mind anymore; I feel like I’m stuck in a vastness of unresolve! I hear ya! What really worked for me when I was feeling very confused was choosing to take the time to see my son’s love for video games through *his* eyes. What was bringing him joy as he played? What was it that kept bringing him back to that activity? Once I deeply understood the playing from his perspective (over months), I no longer just saw “screen time,” but a number of specific things that I could now identify and understand. I finally got it! And that deeper understanding helped me better connect with him through games (and TV shows). When I knew what he enjoyed, I could bring much better suggestions and surprises to our relationship. Which deepened our connection more. I could participate in conversations with him, rather than listening with a blank look (or worse, judgement). More connection. And in turn I learned more about him. It ended up being a wonderful circle of connecting and learning that continued to deepen our relationship over time. 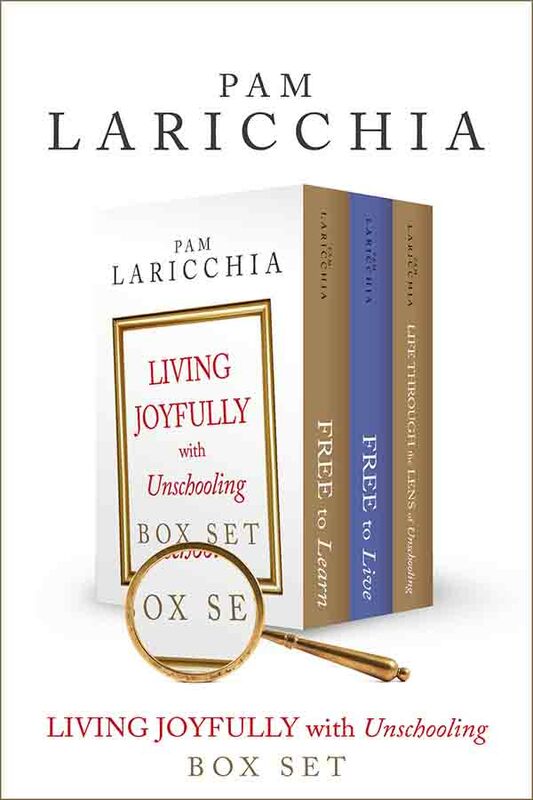 Thank you so much Pam Laricchia for writing your livingjoyfully.ca blog. I’m a lurker, quietly reading all of your blog posts through the feedly.com RSS reader along with another 100 people who are also silent readers. I never post comments, until now. 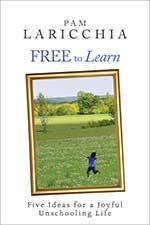 Your written thoughts are changing how I think and who I am as a person and a parent. My little baby girl will have a happier life and a richer lifelong learning experience thanks to you. And thanks for a taking a moment to pop into the comments. I appreciate hearing that my writing resonates with you. 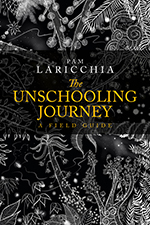 I wish you and your daughter a lovely unschooling life. Hi, I’m about to purchase your book set. 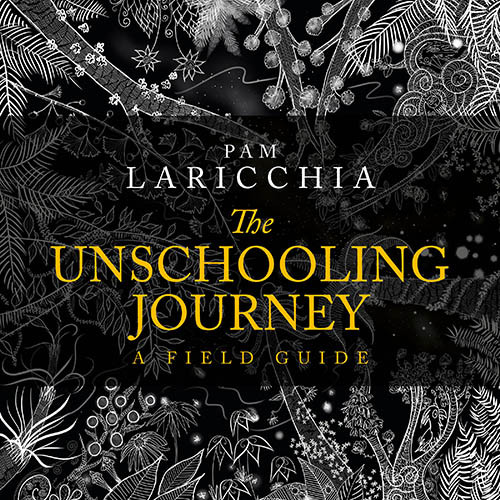 “Living Life Joyfully with Unschooling” (I think that’s the title…)… Anyway, I want to buy the ebook a directly form you, but then, I wondered… can I put them straight into my iPhone’s iBook app? Sorry. I haven’t really used iBooks much and still not sure about it.